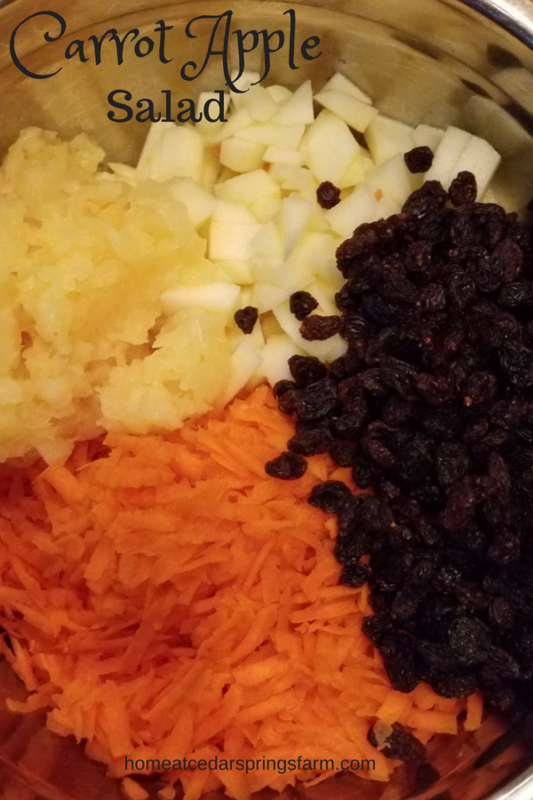 Crunchy carrots, sweet apples, pineapple, and raisins make this “easy” salad perfect for any day of the week. 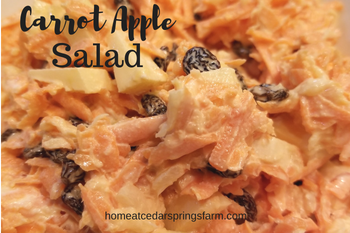 Carrot Apple Salad– Carrots, pineapple, apple, and raisins make for a delicious salad for just about any occasion. This is an easy dish to throw together with only a few ingredients and little prep work plus it is super yummy! I remember when I was younger seeing this carrot apple salad in the grocery store deli. I never did get enough nerve up to try it. Wow, was I missing out! This stuff is AWESOME!!! This Carrot Salad can be made in advance and refrigerated until you are ready to eat. It is coated with creamy mayonnaise to hold everything together, and it gets better the longer it sits in the refrigerator. You can buy the carrots already grated, but it is better if you grate the carrots yourself. Hand- grated carrots are more tender and not as crunchy as the pre-grated ones. This salad goes well with just about anything! Try it the next time you grill out or have a gathering. Your friends and family will love it. Try this Grape Salad. It is also a cool and refreshing salad as well. Some of the links on this page are affiliate links. 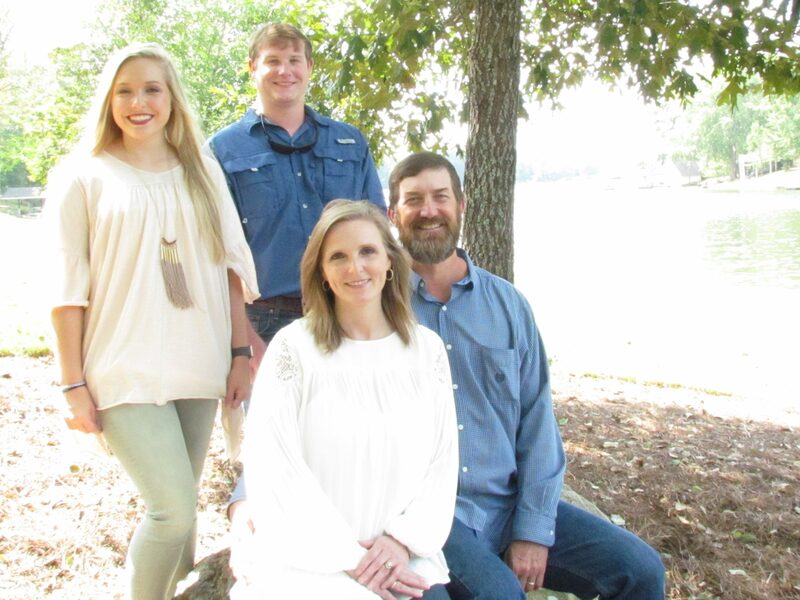 Home at Cedar Springs Farm may earn a commission for purchases made after clicking links on this page. Learn More. 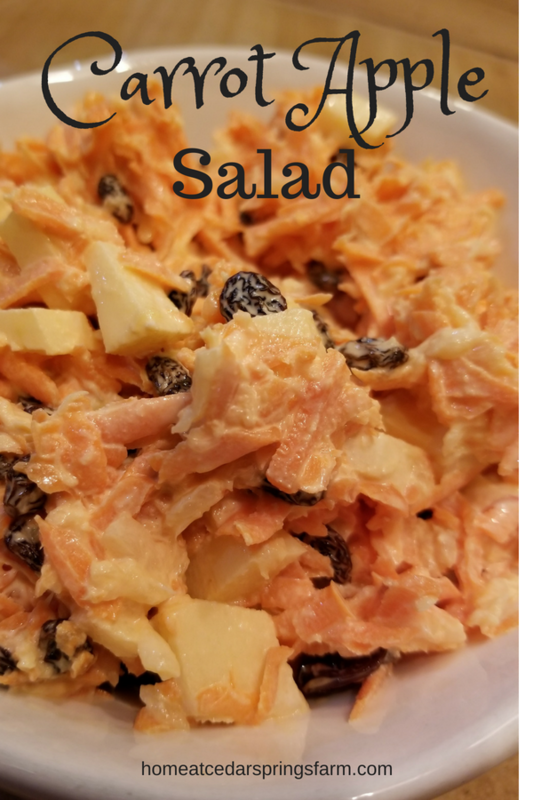 Crunchy carrots, sweet apples, pineapple, and raisins make this "easy" salad perfect for any day of the week. In a medium bowl grate carrots, dice apple, drain pineapple, add raisins. Mix together mayonnaise and sugar. Pour over carrots, apple, pineapple, and raisins. Toss to coat evenly. Refrigerate for several hours. Enjoy! This looks delicious! I need to try it when we barbecue this weekend! This sounds like the perfect recipe to take to a family party or picnic. Simple to make but still yummy! I know the name would probably be too long if you included the pineapple, but I was semi-interested at the carrot apple salad because I’ve tried some of those before. But happily I click on it, and found that my fave pineapple was also a star of the show – so I’ll be trying this soon. Thanks for the recipe. I’ve never thought to put carrots with fruit! I think my son would really like this!